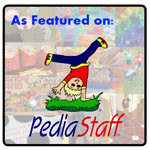 Working with children in grades K-12, I do not own many applications for ages younger than 5. I was pleasantly surprised that I could customize the application to use with slightly older populations in my elementary school setting. However, in addition, over the past three weeks, I have been working with a two year old. Therefore, when I was given the opportunity to check out the application iBaby Buttons, I was excited because I had recently worked with a younger child! Continue reading for my review of this application as well as a giveaway for the app! iBaby Buttons, developed by Software Smoothie, is a great cause and effect application that can be used not only with babies/toddlers but with children who have autism/PDD, attention difficulties, receptive language disorders, auditory awareness, auditory bombardment, and sensory processing disorders. It is available for the iPod Touch, iPhone, and iPad for only $1.99. This application is cute, fun, and customizable with different backgrounds, sounds, and buttons. It is definitely an attention-grabber! To start the application, press the middle of the screen to begin. A blank background will appear. To change this background, swipe with two fingers across the screen. When you press the screen with one finger, a button will appear with a color fill in the middle. You can drag the button around the screen by pressing, holding, and moving the button of choice. Press the button again to see an image and either hear the word associated with the image stated aloud or the sound associated with the image. This is great for children who are learning everyday vocabulary! iBaby Buttons comes with 50+ images and narrations/sounds. Create as many buttons as the screen can fit! After you press the button a second time, it will "pop" and disappear. To head back to the main screen, double-tap with two fingers and it will bring you to the menu. The application is played in Portrait or Landscape format but the main pages are in Portrait format. On the main screen, you will see the option to customize the application in three different ways. When the "Standard Buttons" option is chosen, you are able to select and deselect which preloaded vocabulary/images to be used. You can "Disable All"/"Enable All" by pressing the button in the top right hand corner of the application. Press to the left of each image/vocabulary text to select or deselect an individual item. If an image/vocabulary is selected, a green circle with a check in the middle will appear next to it. If an image/vocabulary is deselected, a red circle with an x is shown next to the item. Press the "Custom Buttons" option to create your own buttons with images/vocabulary. Press the "+" button to add a new button. First, choose the name of the button so that it can be selected again from a list of your "Custom Buttons". Next, you can choose the color image on the back of the button that appears when the screen is initially tapped. After that, choose the image for the middle of the button once it is tapped. If you wish to chose an image on the camera roll, select the associated icon. Otherwise, take a picture by selecting the camera button. Once an image is chosen, you can move and scale the image. After the image is set, press the "Use" button. Your image will be centered in the button. To record a sound to be associated with the button, press the red circle underneath the "Record Sound" text. Then, speak into the microphone and once you are done recording, press the stop button. You can play the audio back by pressing the triangular play button. When your button is complete, press the "Save Button" button at the bottom of the screen. Your button will now appear on your "Custom Buttons" list. You can choose which language the narrator in the application speaks by choosing the "Language" option from the "Customize" menu. There are two choices for languages: English or Nederlands. Tap the "Home" button in the upper left hand corner of the screen to head back to the main page and get started playing the app! Application play will be the same as stated above but with your customized settings. This application definitely holds a childs' attention and is very colorful. It allows a child to press on the screen as many times as they would like to create new buttons and be bombarded with sounds and vocabulary. I love that there is the ability to customize the application with my own images because I can then create custom buttons with vocabulary specific to my students. This makes it worth the $1.99 price alone! The sounds associated with some of the images are great for auditory awareness of real-life sounds. The images on the buttons are also real-life which is great for learning vocabulary! It would be great to have the ability to choose buttons in different vocabulary categories and have more images preloaded (such as food, colors, shapes, etc.). A couple of the images/sounds would be good to be changed. The two I am thinking of are the baby doll due to the fact that the narrator is laughing throughout stating the name so it is hard to hear and the water glass shown looks kind of like a shot glass which is not appropriate for children. However, you can choose to not use whichever buttons you would like by selecting/deselecting them. Some of the images play the sound of the picture or state the name of the image. It would be cool to choose the option of playing the narration, sound, or both! Even if it could be stated next to which items the ones that play environmental sounds versus short songs versus narration of the vocabulary item, that would be helpful! Receptive Language - You can use this application to help students learn vocabulary items. If you customize the buttons, you can even have buttons selected for a specific category or items specific to the student. Another way to use this app for receptive vocabulary skills is to have a student press all of the buttons once, and then find a vocabulary item or state the vocabulary item associated with the button. Finally, the student can compare/contrast or describe button colors or images/vocabulary. Auditory Awareness/Bombardment - Use this application to bombard students with different vocabulary and environmental sounds. Memory/Social - Take pictures of different people that the student/client interacts with throughout the day and place them on buttons. Then, record the persons' name associated with the image. This way, when the user plays, he or she will be hearing the names of common people in their day during app play and it will help them associate the names with the faces! Even better - have each person record his or her own name so that the user can identify his or her voice! Expressive Language - Have the child create a story using as many of the images on the buttons as he or she can. Articulation - Place images of different words that have a persons' target sound in which he or she is practicing onto buttons and have him or her say the words as he or she pop the buttons to practice the sound. 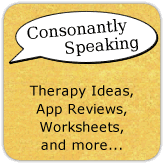 Consonantly Speaking was given an application code by the developer to trial the application for the review as well as four application codes to give away to readers. No other form of compensation was given.